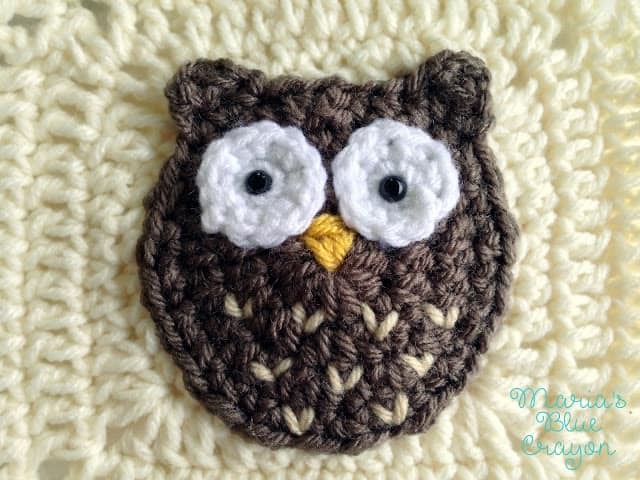 GET THE CROCHET OWL APPLIQUE ALONG WITH THE GRANNY SQUARE PATTERN IN AN AD-FREE PDF DOWNLOAD HERE. This owl is super cute and plump! I love his big eyes and the roundness to him! He makes a great addition to the other squares I have already created. If you are only finding out about my Woodland Afghan now, click here to learn more! There you will find all the animals I have designed so far as well as how to work up the granny squares. I have begun to join my squares, adding them as I go along. I soon will have instructions of how I am constructing this blanket once I get a little further along in the process! I’m a big fan of joining as you go because making square after square gets a bit tedious, and to leave all the joining for the end scares me. But that’s just my personal preference! If you can’t wait, I can tell you that I am using a SC join on the back of the squares. If you are familiar with this method, go for it! Or if have a different method you prefer, go for it! I have FOUR MORE squares to design. That means we are past the half-way mark in terms of animal squares for this blanket. I hope you are all enjoying these critters so far! And I always love seeing your work, you can tag me on instagram @mariasbluecrayon or share with me on my facebook page here! This little guy will be worked in the round. Join taupe yarn 5 spaces to the right of where you fastened off the main body. Join taupe yarn 3 spaces to the left of where you fastened off the main body. Fasten off and leave tail for sewing onto main body of the owl. Sew eyes onto owl and attach safety eyes in the center of each eye. Using a tapestry needle and mustard color yarn, sew on the beak by using a running stitch horizontally and vertically to create the beak. Using a tapestry needle and ecru colored yarn, create the feathers using a running stitch to form ‘V’ patterns in rows. It is very frustrating! Boxes pop up so much that I can hardly read your page. If I didn't like this afghan so much, I would not bother to visit this site. Hi Sherry! In order to keep this blog a free site, I use third party ads to compensate. There is an ad-free printable you may purchase. Sorry for the frustration! Love this little owl. Cant wait to see the rest! A bald eagle would be cool. 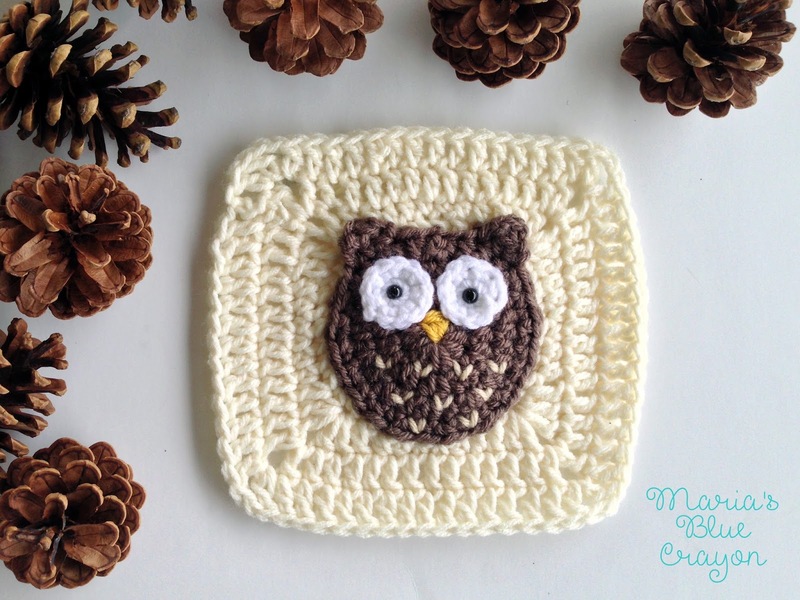 So you crochet the owls and then sew them onto an already crocheted granny square, is that right? My husband's Aunt has been looking for an owl pattern. Looking forward to sharing it with her. I Fell in love with this owl! But trying to find a granny with the owl as the actual center of the granny that goes out from there. I've seen hearts, etc, but not an owl. is there any way in your professional opinion to accomplish this? Would it be ok to make your owl and then try to expand it on my own? This owl is so cute and I would love to make it. Is there any video tutorials for the owl. I am dyslexic so really struggle to follow patterns. Hello Maria! Thank you so much for the adorable Woodland Granny Squares! I love them! I was just wondering how many skeins of each of the colors of yarn (Lion Brand Vanna's Choice) you would use for an entire owl (only) afghan? Hello! When it says you 1sc, 2sc 11 times do you repeat till the end of the row or just do 11 times and tie off? Thanks! How do you secure the owls to the squares without the yarn you use showing on opposite side? Basically, you sew it onto the top layer of your crochet so it doesn’t show on the back! 🙂 I hope that helps!